VATICAN CITY - The Benetton clothing company withdrew an ad Wednesday featuring Pope Benedict XVI kissing a top Egyptian imam on the lips after the Vatican denounced it as an unacceptable provocation. 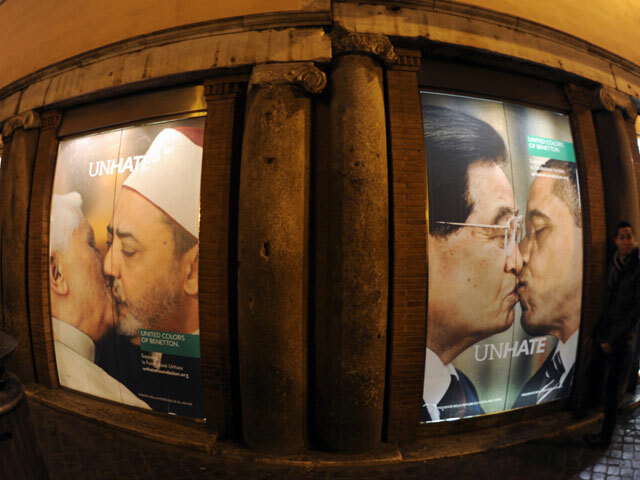 Benetton had said its "Unhate" campaign launched Wednesday was aimed at fostering tolerance and "global love." The campaign's fake photos feature a half-dozen purported political nemeses in lip-locked embraces, including President Barack Obama and Venezuela's Hugo Chavez, Israeli Prime Minister Benjamin Netanyahu and Palestinian President Mahmoud Abbas, and North Korean leader Kim Jong Il and South Korean President Lee Myung-bak. The photo of the pope kissing Sheik Ahmed el-Tayeb of Cairo's al-Azhar institute, the pre-eminent theological school of Sunni Islam, had been on Benetton's website all day but was pulled about an hour after the Vatican's protest. Al-Azhar suspended interfaith talks with the Vatican earlier this year after Benedict called for greater protections for Egypt's minority Christians. A Benetton spokesman confirmed to The Associated Press that the pope-imam ad was no longer part of the campaign. It wasn't clear if the ad had been published anywhere; on Wednesday images from the campaign were unfurled briefly in Milan, New York, Paris, Tel Aviv and Rome but were quickly taken away. Vatican spokesman the Rev. Federico Lombardi called the ad an "unacceptable" manipulation of the pope's likeness that offended the religious sentiments of the faithful. "It shows a serious lack of respect for the pope," Lombardi said in a statement that warned that the Vatican was studying measures to protect the pontiff's image. Shock ads have long been a part of Benetton's publicity strategy, with photographer Oliviero Toscani's famous campaigns featuring death row inmates and people dying of AIDS. The death row inmates ads prompted retailer Sears to stop selling the brand. The state of Missouri filed a law suit, saying it was deceived by the company when they asked to used the prisoners for their ads. Benetton said the photos of political and religious leaders kissing were "symbolic images of reconciliation, with a touch of ironic hope and constructive provocation, to stimulate reflection on how politics, faith and ideas, when they are divergent and mutually opposed, must still lead to dialogue and mediation." In a statement, the Treviso, Italy-based clothing manufacturer said it was sorry that its image had offended the faithful and that as a result "we have decided with immediate effect to withdraw this image from every publication." The rest of the ads are still available on the Benetton website.